A new menu is in the works for hungry cosmonauts with a taste for Japanese cuisine. On June 27, in a move to expand the menu aboard the International Space Station, the Japan Aerospace Exploration Agency (JAXA) certified 29 Japanese food products from 12 manufacturers as official Japanese space food. 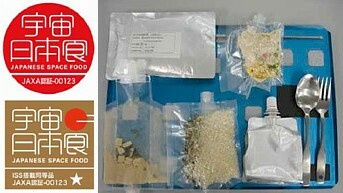 All items on the Japanese space menu -- which includes instant ramen, curry, onigiri (rice balls) and powdered green tea -- satisfy the International Space Station's stringent standards requiring packaged foods to withstand changes in air pressure and temperature and survive one year in storage under ordinary earthly temperatures. To meet these requirements, the food products are packed in special tubes. The foods also satisfy the preparation time requirement, which calls for food to be ready to eat in less than one hour after adding heat or water. In addition, much of the space food has been redesigned to prevent it from scattering in zero-g. The ramen, for example, features a thick broth and noodles that are clumped together in bite-sized pieces. Extra flavoring has also been added because food tends to taste bland in zero-g.
Once the ISS menu is expanded to include the Japanese space food, astronauts aboard the space station will be able to eat it as they wish. Japanese astronaut Koichi Wakata, who is scheduled for a long-term stay aboard the International Space Station beginning in the fall of 2008, will undoubtedly appreciate the new fare. Excellent. Looks like quite a nice lunch. Better than some I've had here on earth in fact!